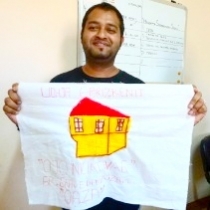 Making a Point: Gylten led the quilting group from Iniciativa 6 and produced four squares for the Prizren Roma Quilt. 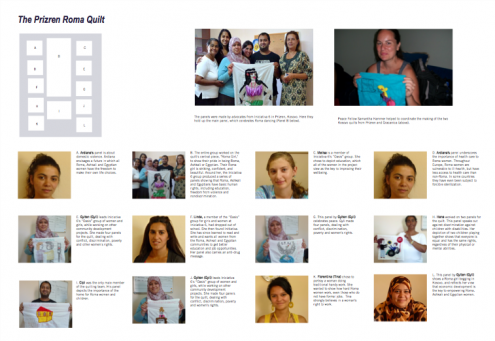 The quilt is more political than other Roma advocacy quilts. 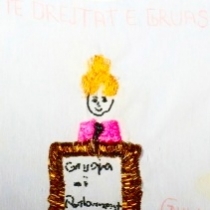 In the summer of 2011, Peace Fellow Samantha Hammer worked with two Roma groups in Kosovo to produce two advocacy quilts. One of the quilts was produced in Gracanica, the other in Prizren. 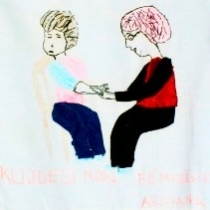 Samantha visited Prizren several times to help Inicitiva 6 put together the second Kosovo quilt. She was amazed at how well they worked together. 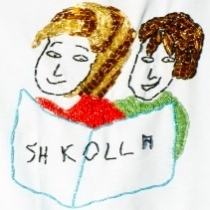 In one of her blogs, Samantha described a trip to the market to buy material for the quilt. It turned out to be a voyage of discovery – and friendship: “A group of seven of us set off for the city center, toward the bazaar. The 22-year-old group leader, a woman who’s always got a plan, told me she could get the best deal on fabric – as long as I kept quiet and didn’t let the shopkeepers think I was an international with euro-lined pockets. So when we got to the marketplace I resisted snapping photos of the stalls jammed with shimmering fabrics, heavily embroidered wedding vests and sequin-covered everything. The leader looked back at me every few feet and winked, reminding me to keep our secret. “The other girls giggled. We all crowded into a stall stocked with enough beaded finery for 300 spangled Kosovar weddings, and after a few minutes of the leader haggling – success! 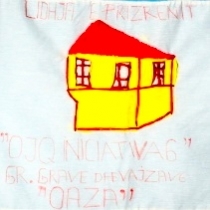 The Prizren quilt is more openly political than its Gracanica counterpart and depicts acts of discrimination against Roma women in Kosovo. But it is also dominated by the large panel of a dancing girl, who symbolizes beauty and the importance of dancing to Roma culture. Lule, a local seamstress, helped to organize the panels into a pattern and the final assembly was completed under the auspices of Open Door, a Roma nonprofit, to the great delight of Beti, the Executive Director (pictured left). 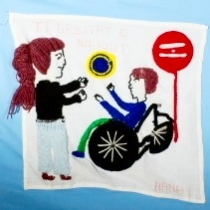 In late October 2011, the two Kosovo quilts were displayed for the first time in Granada, Spain at the third International Conference of Roma Women. Mimoza Pachuku, the new coordinator of PROGRAEK, attended the conference and explained the themes of the quilts to conference delegates alongside Emilie Horackova, from the Czech Republic. By early 2012, however, the Gracanica quilt was showing signs of wear and tear, and AP took it to Sumter, South Carolina, to be re-assembled by quilters Bobbi Fitzsimmons and Sharon Sisson of the Swan Lake Quilt Guild. 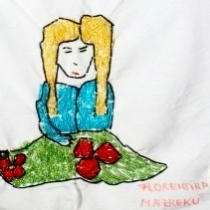 The quilt then joined the four other Roma quilts at the Kean University exhibition in 2013 where it hung between quilts from Roma in Lithuania and the Czech Republic. 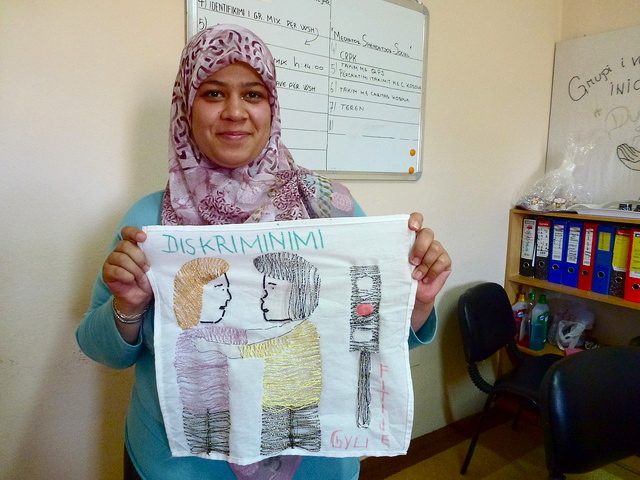 Beti from Open Door Assembles the Prizen quilt in Kosovo. 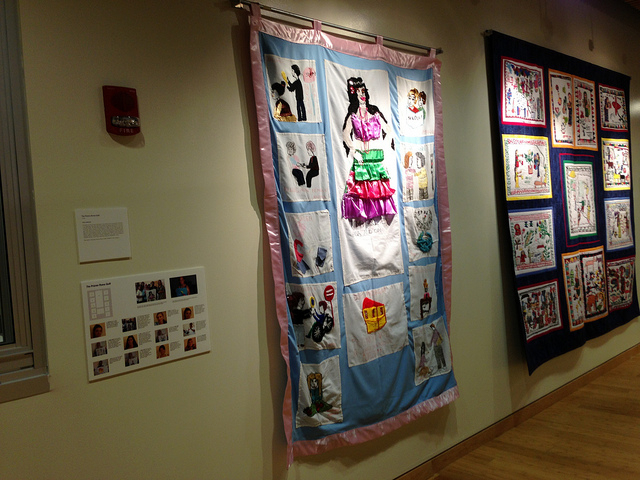 On Display: The Prizren Roma Quilt hangs next to the Women’s Health Quilts at Kean University, 2013. The entire group worked on the quilt’s central piece, “Roma Girl,” to show their pride at being Roma, Ashkali or Egyptian. Their Roma girl is striking, confident, and beautiful. 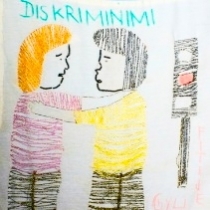 Around her, the Iniciativa 6 group produced a series of panels showing that Roma, Ashkali and Egyptians have basic human rights, including education, freedom from violence and nondiscrimination. Ardiana’s panel is about domestic violence. There is little hard data on the scale of this problem in the Roma, Ashkali and Egyptian communities – or of differences between them. 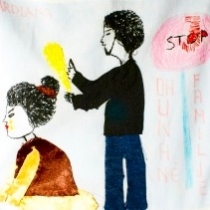 However, the OSCE (2009) found domestic violence to be one of the main security concerns of women in Roma communities, just as it is for women in Kosovar society at large. Ardiana envisages a future in which all Roma, Ashkali and Egyptian women have the freedom to make their own life choices. 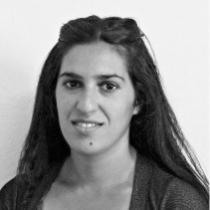 She is a member of the Oaza group at Iniciativa 6. Her panel underscores the importance of providing health care for women. Throughout Europe, Roma women suffer from higher than average health problems, while having less access to health care than non Roma. In some countries they have even been subject to forcible sterilization. 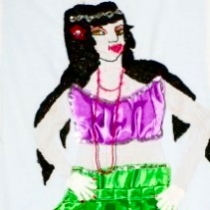 Hana is originally from Albania, where she owned a successful textile business. She moved to Prizren when she got married. Passionate about empowering the Roma community, she began volunteering at the Initiativa 6 Center. Hana worked on two panels for the quilt. 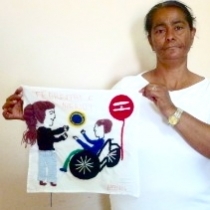 In one, she speaks against discrimination against children with disabilities. 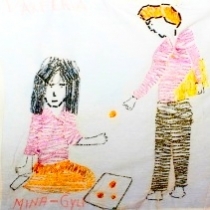 Her depiction of two children playing together shows that everyone is equal and has the same rights, regardless of their physical or mental abilities. Hana also collaborated on “Roma Girl.” Hana’s goal is that every Roma woman and girl should go to university and be employed. Linda, a member of the “Oasis” group for girls and women at Initiativa 6, had dropped out of school when she found Initiativa. She has learned to read and write through Initiativa’s program. 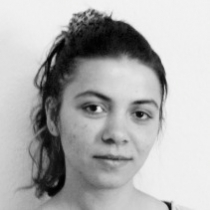 She wants all women from the Roma, Ashkali and Egyptian communities to get better education and job opportunities. 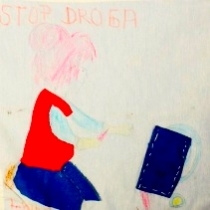 Her panel carries an anti-drug message. While she does not believe that drug abuse is widespread in her community, she is still worried that it might take hold. Data from other European countries suggests that drug use may have a particularly harmful impact on Roma communities because Roma lack access to social services, prevention and rehabilitation programs. Florentina (Tina) is a member of the “Oasis” group at Iniciativa 6. For her panel, she chose to portray a woman doing traditional hand work. She wanted to show how hard Roma women work, even those who do not have formal jobs. Tina strongly believes in a woman’s right to work. She is currently in her last year of high school, and volunteering at Prizren’s Roma radio station while preparing to study medicine at university. 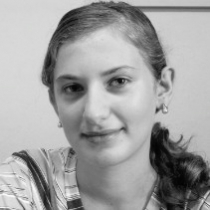 Melisa is a member of Iniciativa 6′s “Oasis” group. She chose to depict education, which all of the women in the projevct view as the key to improvinv their wellbeing. According to UNICEF (2007), only 13% of Roma, Ashkali and Egyptians (boys and girls) in Kosovo between the ages of 16 and 19 are in school. Only about 1% attend university. Only 69% of Kosovar Roma, Ashkali and Egyptian women in the 25-34 age group are literate. The numbers are actually worse for the younger generation – only 56% of women aged between 15 and 24 are literate. Melisa is an ethnic Albanian who joined the Oaza group after discovering that Initiativa 6 center was based in her neighborhood. She has found that Roma, Ashkali and Egyptians are no different from Albanians, and that they would all get along if they would work together. Melisa also thinks that it is important for children of different ethnicities to have a chance to go to school together so that they can learn from and help one another. Gylten (Gyli) leads Iniciativa 6′s “Oasis” group of women and girls, while working on other community development projects. 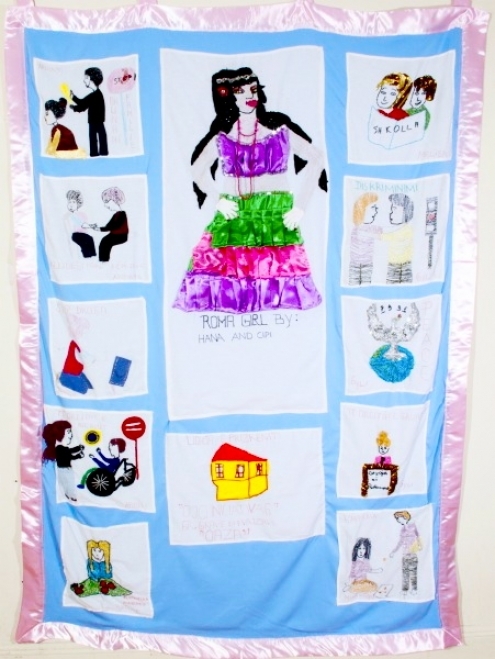 She made four panels for the quilt, dealing with conflict, discrimination, poverty and other women’s rights. 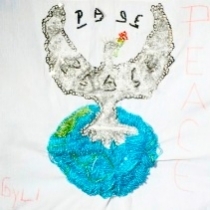 One of Gylten’s panels celebrates peace. The next panel by Gylten shows a Roma girl begging in Kosovo, and reflects her view that economic development is the key to empowering Roma, Ashkali and Egyptian women.